Every day it seems a new website or service experiences a security breach. Sometimes it's a big name and you hear about it and you even remember to change the password. But many times you aren't informed or you don't get around to changing your password. In response to these breaches, Dashlane sends its users security alerts. Whenever one of your accounts in Dashlane experiences a breach, you're informed. You receive a pop-up in Dashlane, and a notification on your Identity Dashboard. If you're a Premium user, you also benefit from Dark Web Monitoring, where we scan the dark web for leaked personal data associated with up to five email addresses, and sends you alerts when any is found. 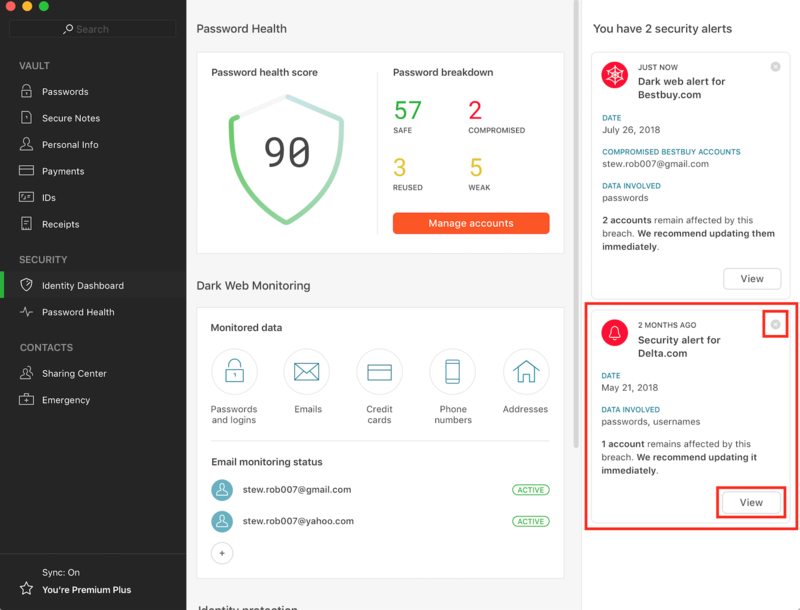 Simply by having your accounts in Dashlane, and setting up Dark Web Monitoring if you're Premium, we can alert you to the problem and tell you what to do to solve it. How do security alerts work? What are Dark Web Alerts? Typically, a breach is discovered well after it actually occurred. When we alert you to a breach, the breach itself could have occurred even months before. We consider your password compromised if you did not change it nor create the account since the date of the breach. Importantly, in addition to the compromised accounts themselves, Dashlane determines if any of your other accounts use the same or similar passwords, and considers these passwords compromised as well. You will receive an alert for all of these accounts as a popup when you open Dashlane. You'll also see corresponding alerts in your Identity Dashboard. The alerts remain in your Identity Dashboard until you either change the affected passwords or else dismiss the alerts. Click on or tap View to see the details of the alert and take action, otherwise click on or tap the small circle with an X to dismiss the alert. If you are a Premium user, you are able to receive alerts from the Dark Web Monitoring feature. You're able to monitor up to five email addresses at a time. Dark Web Monitoring scans data from the dark web for personal information attached to those five email addresses. This matters, because if your data is available on the dark web, it may be bought or used by hackers and spammers. If Dark Web Monitoring finds any of your information, a personalized alert is sent to you detailing what was found, and inviting you to change the passwords for the affected accounts. An alert is first a pop-up message within Dashlane, but you can also always go to your Identity Dashboard to see your ongoing alerts. As with security alerts, you may click or tap to see the details of the alert and take action, or else to dismiss the alert. For more information about this feature, read How to set up and use Dark Web Monitoring, or the Frequently Asked Questions about Dark Web Monitoring. If Dark Web Monitoring finds a password that matches one of your accounts in Dashlane, we consider that account compromised. When this happens, we notify you and invite you to change those passwords, as well as any passwords similar-enough to the ones we found. Dark Web Monitoring may also turn up passwords you haven't stored in Dashlane, and for which we can't determine the corresponding account. In this case, Dashlane will inform you of the passwords it found, in the hope that you can identify and secure the accounts to which they belong. Naturally, we invite you to use Dashlane for those accounts, and to make and remember a strong, unique password for each one. In the pop-up, click Take action to change your passwords. Click I'll do it later to close the pop-up. You will still see the alert in your Identity Dashboard. In your Identity Dashboard, click on View to change your passwords. Click on the small circle with an X in it in the upper-right-hand corner of the alert to dismiss the alert entirely. Once you've clicked on either Take action or View, you will be taken to your Password Health screen, where you will see your compromised accounts. Roll over the account you want to update, and click on Replace now. On the website, change your password as you normally would, making sure to allow Dashlane to update your password in the app. If you receive an alert for passwords you don't have stored in Dashlane, those passwords are initially hidden from view. To show the passwords, click on Reveal. Click Dismiss to close the pop-up. You will still see the alert in your Identity Dashboard, from which you can permanently dismiss the alert. In the pop-up, tap TAKE ACTION NOW to change your passwords. Tap DISMISS to close the pop-up. You will still see the alert in your Identity Dashboard. In your Identity Dashboard, tap VIEW to change your passwords. Tap the small circle with an "x" in it in the upper-right-hand corner of the alert to dismiss the alert entirely. Once you've tapped either TAKE ACTION NOW or VIEW, you will be taken to your Password Health page, where you will see your compromised accounts. Tap on the three-dot menu to the right of the compromised account, and select Go to website. Once on the website, change your password as you normally would, making sure to allow Dashlane to update your password in the app. If you receive an alert for passwords you don't have stored in Dashlane, those passwords are initially hidden from view. Tap DISMISS to close the pop-up. You will still see the alert in your Identity Dashboard. Tap VIEW DETAILS to go to the alert in the Identity Dashboard. In your Identity Dashboard, to show the passwords, tap the eye icon. If you tap CLOSE or the small circle with an X in it, this will dismiss the alert entirely, so please note the passwords we found before doing so.